He has trouble with other people's success.—on of many putowns voiced at this party. The cast (Photo by T. Charles Erickson). 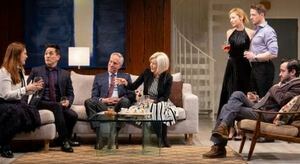 Combine elements of an ironic de Maupassant short story with Edward Albee's Who's Afraid of Virginia Woolf and you get The Engagement Party, Samuel Baum's amusing, absorbing, assured, anti-heroic play in its world premiere at Hartford Stage. As staged by the theater's artistic director, Darko Tresnjak, and acted with believability by a splendid cast, this part mystery, part sophisticated drawing room drama covers a lot of ground in its compact 85 intermissionless minutes. The setting is a Park Avenue duplex, a luxurious atelier designed by Alexander Dodge. On a turntable, the action flows from living/dining room to kitchen to upstairs bedroom. Despite its expansiveness, the apartment feels hermetic and unspontaneous, as if every knick-knack were planned by computer. Like the pretentious furnishings, what transpires is an evening that digs down from superficiality to one of lies, suspicions and secrets. A compendium of the seven deadly sins —envy, pride, lust, gluttony, greed, sloth, wrath — it concerns Wall Streeter Josh and his fiancée Katherine who are throwing a party to honor their engagement and her $300,000 ring. Invited are her parents and friends, plus loud, good-hearted Johnny, who knows Josh from childhood days in Canarsie. Playwright Baum's scheme includes many ethnicities: Jewish, Italian, Asian, Protestant. It's an equal opportunity gathering. Starting with jolly banter, the evening soon devolves into emotional afflictions, betrayals and lies in which "a number of things were said tonight without thinking." What starts as a lighthearted gathering soon turns dark, as truths emerge and motivations are suspect. Like cancers that fester before revealing themselves, surface manners are undercut by seething resentments. When Gail, Katherine's mom, enters using a crutch, implied is some sort of handicap. When Conrad, her imperious husband, is made to confront a shocking secret, a veil is pulled forcibly back from purulent sores. Diseases will burst forth. Haley, Katherine's best friend and a new mother, needs a job; Kai her husband, is envious of Josh's success. Alan is a Columbia University professor with an anti-establishment bent, while Johnny reminds Josh of a hardscrabble past. All good will is splintered when an accidental wine spillage leads to rising suspicions and recriminations. Director Tresnjak dovetails the action so smoothly you're always aware that something is continuing to happen elsewhere even though you're concentrating on the scene before you. We may be in the kitchen, but what's going on in the dining room? How about behind the closed bedroom door? Tresnjak emphasizes the characters' cool surfaces amid hot resentments. Zach Appelman's Josh, Beth Riesgraf's Katherine, Richard Bekins' Conrad, Mia Dillon's Gail, Anne Troup's Haley, Brian Lee Huynh's Kai, Teddy Bergman's righteous Alan and Brian Patrick Murphy's tough but gentle Johnny — all are excellent portraits. Dodge's lavish scenic design is colorfully lit by Matthew Richards. That's appropriate for this clever, fast-paced work that impales its characters as if they were on display in a diorama of a broken civilization. Highlight one of the responses below and click "copy" or"CTRL+C"
Feel free to add detailed comments in the body of the email. . .also the names and emails of any friends to whom you'd like us to forward a copy of this review.